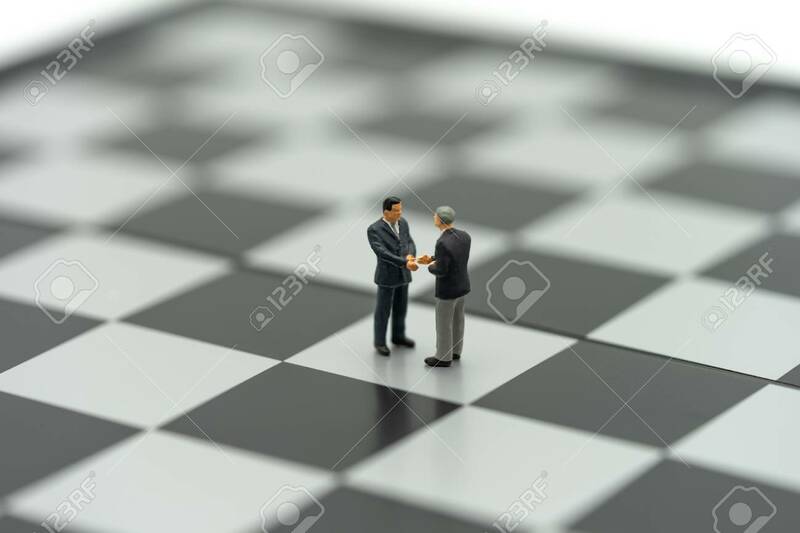 Miniature 2 People Businessmen Shake Hands On A Chessboard With A Chess Piece On The Back Negotiating In Business. As Background Business Concept And Strategy Concept With Copy Space. Lizenzfreie Fotos, Bilder Und Stock Fotografie. Image 114603442. Standard-Bild - Miniature 2 people businessmen Shake hands on a chessboard with a chess piece on the back Negotiating in business. as background business concept and strategy concept with copy space. Miniature 2 people businessmen Shake hands on a chessboard with a chess piece on the back Negotiating in business. as background business concept and strategy concept with copy space.